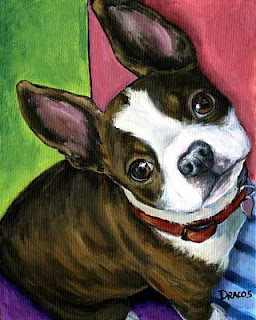 This is a little Boston terrier that I did last week. It was a lot of fun to do. Next week, I have to tighten up again a little - just a little, though. I'll be painting four custom dog paintings, all for return customers, which makes me feel really great. Like so many painters I've heard about, I often think I'm "not good enough." Getting repeat customers makes me feel that I'm creating at least a little good artwork. Every day, though, I pinch myself to be sure I'm not dreaming this most wonderful career I've chosen rather later in life. Isn't it funny that oftentimes we find ourselves fulfilling a life-long dream that we thought we never, ever could do? As a child, I dreamed of two things: being a scientist (yes, I was a weird kid), and being an artist. Well, I was a scientist for many years, mostly a science graduate student (experimental psychology, neuroscience), granted, but a scientist in every sense of the word except the good income. And I loved the academic pursuits immensely - and still do. I am a life-long student in many, many ways. But then one day I knew that my daughter needed me at home, and I was a single mom, having lost my daughter's dad to cancer when she was just 7 years old. So I packed up all my scientific research materials, left my PhD program in my very last year, and started self-learning the "business of art." It was a bit rocky in the beginning, to say the least. But by golly, I persevered, and I was finally able to make a pretty decent living as a full-time artist. I started out making animal sculptures in papier-mache (messy, nasty stuff! ); then I began creating dog, cat, and other animal masks and sculptures in ceramic clay, which I did way too long! and had more success than I knew what to do with. So I dropped the entire business and started painting back in 2006. 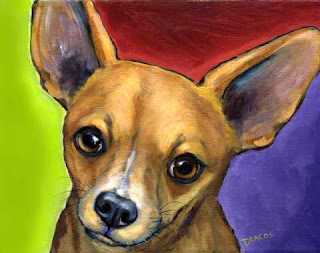 My first paintings were so awful that -- well, you just can't imagine how awful they were! But, once again, I persevered, painting every single day, studying every book I could get my hands on, putting my awful-in-the-beginning stuff out for the public to see every week (at Portland Saturday Market in Portland, OR), getting their feedback (or watching them walk past with hardly a glance - or often, even a guffaw! ), but finally, finally being able to produce some work that didn't make me cringe, then some that looked pretty okay, and so on and so on, until today when I'm finally beginning to feel like I might get the hang of this art/painting career one of these days. I forget who it was, some really, really famous artist whose last words, on his deathbed, were something to the effect of, " Darn it! And I was just getting the hang of it!" As I've been doing for the past few years, I'm still trying to loosen up my own painting work. I do a lot of custom work, which for me at least, requires that I work very tightly so that I can get a really good image of someone's beloved pet. Then when I do my own work, my just-for-fun---and-profit work, I want to loosen up, have a good time, not agonize over every little detail. It's hard for me. As all my family and friends know, I'm an awful, awful perfectionist. Some of that I like, but when it comes to painting, I wish I could "throw caution to the wind" a bit more and have a lot more fun at my "work."